Gmail has provided a terrific email services to all of its users. Not to mention Youtube, and Google Plus account as well. However, a time may come where you no longer require Gmail in your life. In such cases, you can delete Gmail account. 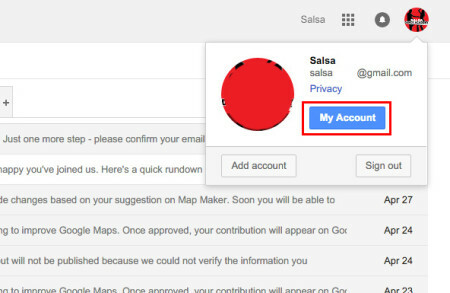 Once you delete Gmail account, your contact information will be lost and you will not be able to access your Gmail account. Delete Gmail account is a serious thing to do and you have to be absolutely sure if you want to do this or not. Once you delete Gmail account, Google will not be responsible for any liability. Step 1: Sign into your Gmail account from your web browser in a new tab (Ctrl + T). 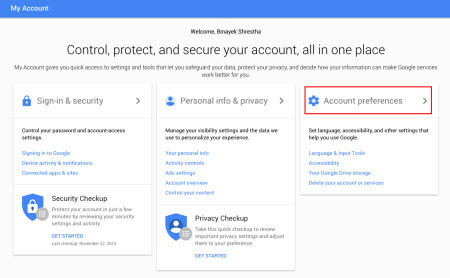 Step 2: Open Account settings of your Gmail account. Click on your profile picture at the top-right corner. Open Account settings by clicking on ‘My Account’. Step 3: Under ‘Account preferences’, go to ‘Delete your account or services’ to delete Gmail account. 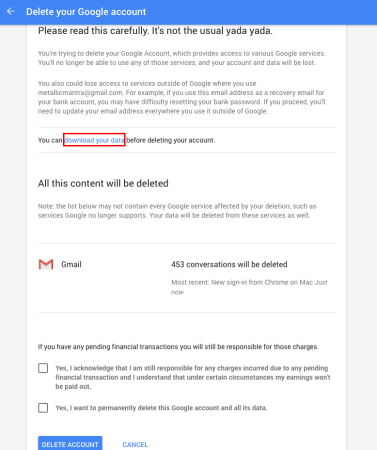 Step 4: When you’re fully directed to ‘Delete your account or services’, click on ‘Delete Google Account and data’ to initiate delete Gmail account. Step 5: Re-enter Gmail password to delete Gmail account. 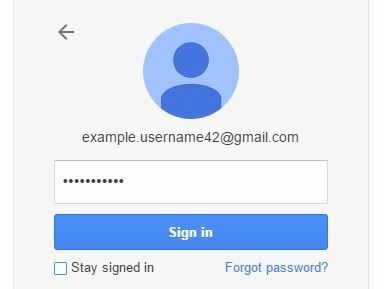 Type your Gmail account password. 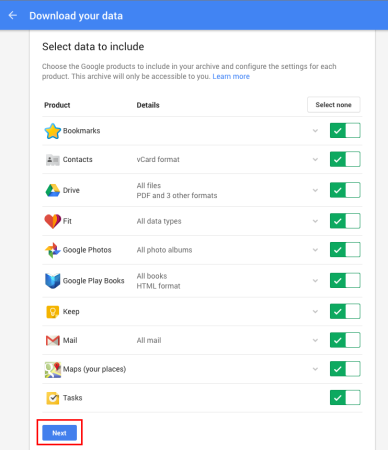 Step 6: You will be able to download your Gmail data in your hard drive or other email accounts If you like. Click on ‘download your data’ to create a backup of your Gmail data. Put a green check on the data you want to back up. 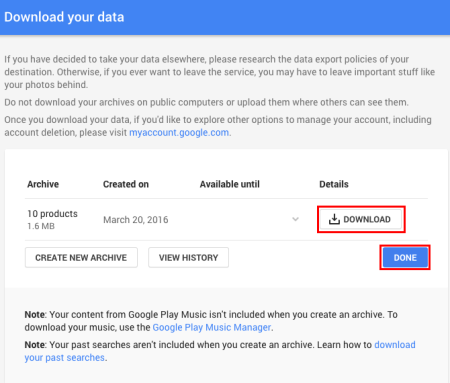 Click on next to allow Google to create an archive of your data. This may take a few seconds or even minutes depending on the amount of data you have. Once archiving is completed, download the backed up data into your hard drive or send it to other email accounts (optional). Ignore Step 6 if you don’t want to back up your data. Step 7: Scroll down to the bottom and read the terms and conditions. If you fully agree with it, put a tick on both the conditions. 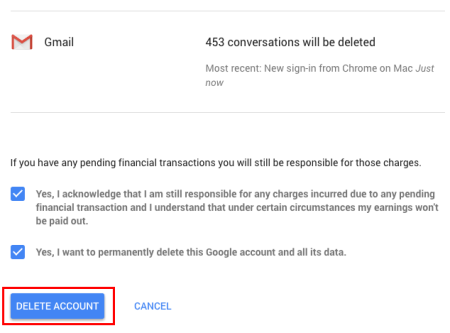 Step 8: Click on ‘DELETE ACCOUNT’ to delete Gmail account permanently.